Chris Gibbs graduated with a degree in psychology and health studies in 2001. Since then he set up his own complementary therapy practice and spent 10 years as the last student and assistant to Dr Peter Guy Manners – the original pioneer of Cymatic therapy. During this time he gained extensive knowledge of Cymatic therapy theory, practice and research. Cymatherapy® – a practical guide for everyone. Upon the passing of Dr Manners in 2009, Chris has collated and preserved the Bretforton Clinic library, containing over 40 years of extensive material generated by Dr Manners on the subject of Cymatics and Cymatic therapy. 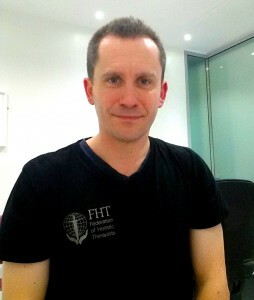 He is currently using this material to provide new publications and guides on Cymatherapy® theory and practice. Chris also has 12 years experience as a Cymatherapy® practitioner and provides complementary therapy services for staff and patients at NHS hospitals in Oxford and London. In this presentation, Chris will introduce the simple evidence based research methods that are currently being used by the NHS to measure the efficacy of complementary medicine he uses in UK hospital settings. By adapting these methods for Cymatherapy®, Chris has been able to conduct research studies, which will be presented to demonstrate how Cymatherapy® provides effective relief from stress, common musculoskeletal conditions and fitness conditioning. Materials presented in this presentation will also be provided for attending therapists to help them conduct future research studies of their own. Chris will also present a few of his most interesting past case studies, including a family who have been receiving the benefits of Cymatic therapy since Dr Manners opened his clinic in the early 1960’s.